90 points by Wine Enthusiast- Wine Enthusiast wine ratings are based on tastings by the magazine's editors and tasters, either individually or in a group setting. Tastings are typically conducted blind. We set aside the best barrels of our Cabernet to produce Special Selection – the only wine in the world honored twice as Wine Spectator magazine’s “Wine of the Year.” Pushing the limits of richness and concentration, this Cabernet is enjoyable upon release or improves with aging a decade or more. 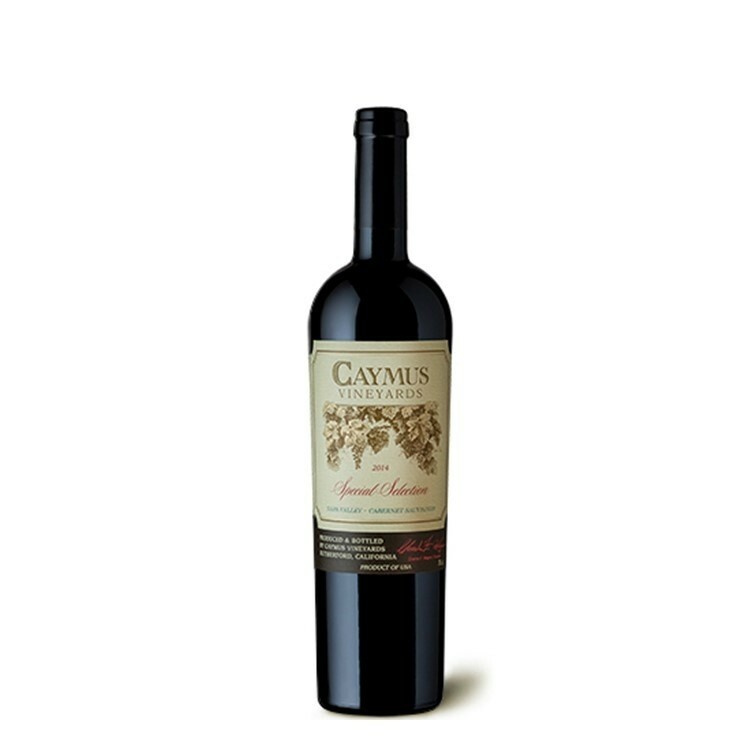 Fine, luxurious tannins give structure to intense flavors of supple cacao bean, chocolate and dark fruits. Here at Caymus we are fortunate to reside in the Napa Valley, so we like to keep things simple. Our quality is the result of a singular focus on cabernet grape growing in a climate where the soils and vines respond very well. While itʹs true that microclimates and various soils produce distinctive nuances, I personally do not believe that one sub‐appellation or vineyard expresses a singular character or quality that can be deemed superior. In my mind, there is little to worry about when a healthy vineyard is well kept, the vigor and crop load are controlled, and there is moderate sunlight. I am a Rutherford man, as were my forefathers who arrived here in the late 1800s and played an integral role in shaping our region’s winemaking legacy, but I’m sure they would agree with me when I say that great wines are now found throughout the wide spread of our Valley. Over the years, I have come to appreciate the greatness of vineyards spanning all the way from Coombsville to Calistoga, and from Howell Mountain to Atlas Peak. We simply have to look at some of the Wine Spectator scores from the 2010 vintage to witness all that Napa Valley has to offer. For example, Bryant ‐ 95 points, Lewis Reserve – 96 points, Schrader To Kolan ‐ 96 points, Harlan ‐ 96 points, Screaming Eagle ‐ 96 points, and Caymus Special Selection – 96 points. These are outstanding scores, but more notably they are sourced from very different regions throughout Napa, both mountain and valley wines. Personally, I am proud to have played a role in the California wine movement over the past forty years. We no longer look to the Old World as a benchmark because we are setting new quality standards of our own. I strongly feel that here in America we are producing some of the greatest wines in the world, not all from the Napa Valley, but when it comes to Cabernet we tend to reign supreme. Over the decades, changes and very compelling realizations have come to light. Big wines that are highly oaked with bitter tannins and over‐the‐top opulence have become passé. The best Napa Cabernets are refined, richly textured, accessible, exciting and balanced. throughout harvest time, but we managed to bring in our fruit with several passes through most vineyards, making picking decisions based on small zones of ripeness. It was a stop‐start harvest that posed many challenges for us and did not come to an end until winter began to set in on November 5th.